Wayne has always loved animals and had been trying to talk me into getting a dog (or a monkey) for years. Now, I have to admit, that I didn’t grow up with an animal at home, and didn’t really understand the connection that human beings could have with a pet. Ever since we welcomed Boink into our family, we found a love and a bond that I cannot even begin to describe, and soon developed a desire to save all the neglected and homeless animals. We wanted to give back in some way that would help other animals find forever homes and loving families… but how? In early January we discovered three girls that are doing just that, in Hamilton, Ontario. Lisa Winn, Melissa McClelland and Janine Stoll are the founders of the Ladybird Animal Sanctuary, and are saving the lives of all of our furry little friends. They are a unified voice for abandoned, abused and neglected animals in the Halton community. Together, through a system of volunteers, foster homes, educators, animal lovers and exceptionally generous people, they aim to eliminate the unnecessary suffering of domestic animals in local high­-kill shelters. Ladybird rescues cats, dogs, small animals, the occasional farm animals, and they never shy away from rescuing senior animals, those with costly medical issues and the so­-called ‘hard to adopt’. Through their success stories, they know that every life is worth saving and that a loving home is just around the corner for these deserving creatures. We want to support these women as they continue to save and care for animals in the Halton community, and are excited to see the money we raise go towards food, shelter, surgeries, medication, blankets, beds and whatever else these animals may need to give them the best quality of life. 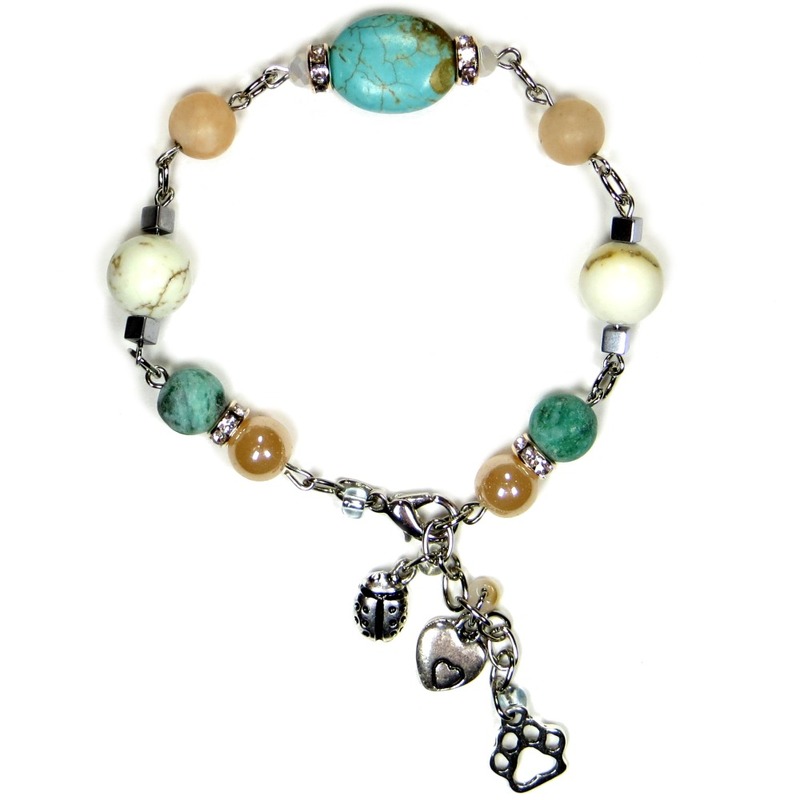 glamjulz are thrilled to be working with these dynamic, forward thinking women, and have designed a beautiful handmade bracelet with turquoise stones, high quality glass beads and a pewter ladybird, heart and paw to help them raise money so that they can continue to help those that cannot help themselves. We thank you for your continued “love & loyalty” and support.